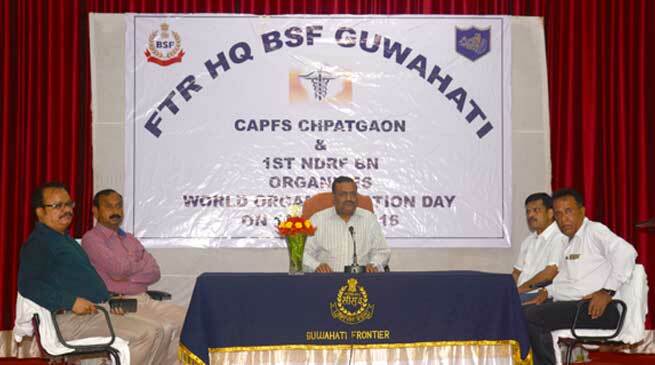 Frontier of Border Security Force BSF observed World Organ Donation Day from 13-16 Aug 2016, here at Patgaon in Guwahati. The ‘‘First line of India’s Defence’’, Border Security Force raised on 1st Dec 1965 for guarding Indo-Pak (now both Indo-Pak and Indo-Bangla) borders of 6387 Kms is considered world’s largest Border Guarding Force with its manpower of around two hundred fifty thousand. The Force draws its uniqueness with its own air and water wings, artillery wing, camel- house- canine contingents, ISO certified institutions like Tear smoke unit, training centres branded as centre of excellence. With its immaculate border management duties, BSF has become a brand for professionalism for all occasions. Be it internal security duties, general elections or any disaster response. Martial element of the force is duly supplemented by Human face as the Force bears the national and social responsibilities. It is a well-known fact that due to non-availability of transplantable organ, many precious lives are lost in our country. In BSF, the members are counseled and educated for importance of organ donation and its humanitarian value. They are being encouraged to educate their family members and relatives to commit themselves for the post life organ donation. BSF for all social causes of Nation building.He conveyed that after life organ and tissue donation shall be considered the supreme among all of social services. The speaker for the occassion was Proff & HOD Dr Rajeev T P, MBBS, MS MCH, Urology (AIIMS) who made the audience aware of the nitty gritties of the issue.